A product that is vegan does not contain any animal ingredients or animal-derived ingredients. This includes, but is not limited to, honey, beeswax, lanolin, collagen, albumen, carmine, cholesterol, gelatin, and many others. To many, the term “vegan” also means that a product is free from animal testing as well. “Vegan” is not regulated term. Henceforth, sometimes, when a product claims to be vegan, it could merely be referring to the fact that the product does not contain animal-derived ingredients. Therefore, items that are tested on animals can, unfortunately, claim to be “vegan”. This is a very important to know. Because a product that claims to be vegan does not necessarily equate to being cruelty-free. Vegan makeup contains less ingredients and more natural ingredients than other cosmetics. Therefore, vegan makeup is far healthier and nourishing for your skin. Vegan makeup also contains more natural ingredients than traditional products and lines. Thus, vegan makeup and skincare is really good for positive anti-ageing. In addition, sensitive skin can benefit greatly from using vegan makeup as the ingredients are far more gentle on the skin, whilst containing less chemicals as well. Using vegan skincare and make-up products also helps nourish dry skin. And for oily skin, the plant-based ingredients are really good at combating oiliness as they provide incredibly balancing hydration. There are many cosmetic lines that are dedicated to being solely vegan and cruelty free. Though, as previously mentioned, some of our well known favorites have been slowly introducing vegan products to their ranges. These products, other than being already tried and tested, are far easier to get our hands on. Which, is incredibly exciting. Because, accessibility to good vegan products can be quite challenging. 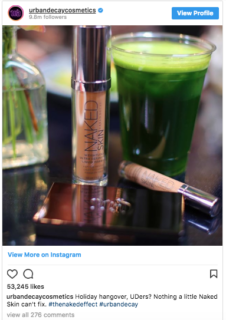 Brands such as: Urban Decay, Kat Von D Beauty, beauty blogger Jeffery Star’s makeup line, and affordable makeup brand Elf all feature vegan products. Brands that are solely vegan include the likes of: INIKA, B.Beauty, PHD Ethical beauty, and Eco Tools.